Bathrooms are some of my favorite rooms to plan and design. Their small size allows for pushing the design envelope and getting extra creative when it comes to spacial planning and storage — two of my specialties. 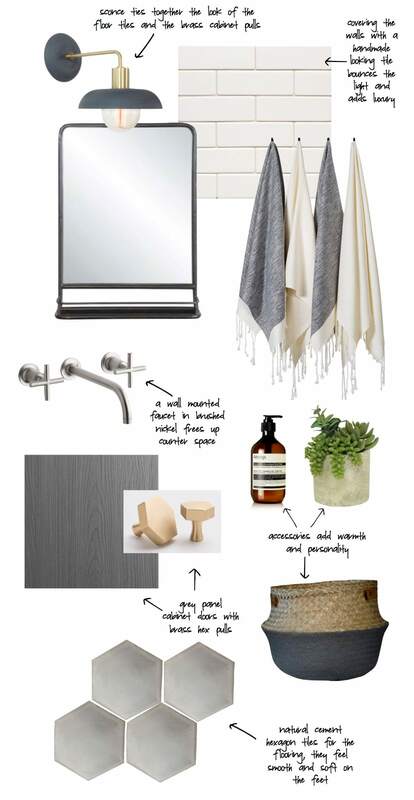 I love moving bathroom elements around to find the perfect combination – it’s like a puzzle and when everything fits – sinks, showers, tubs, etc. – it’s super satisfying. 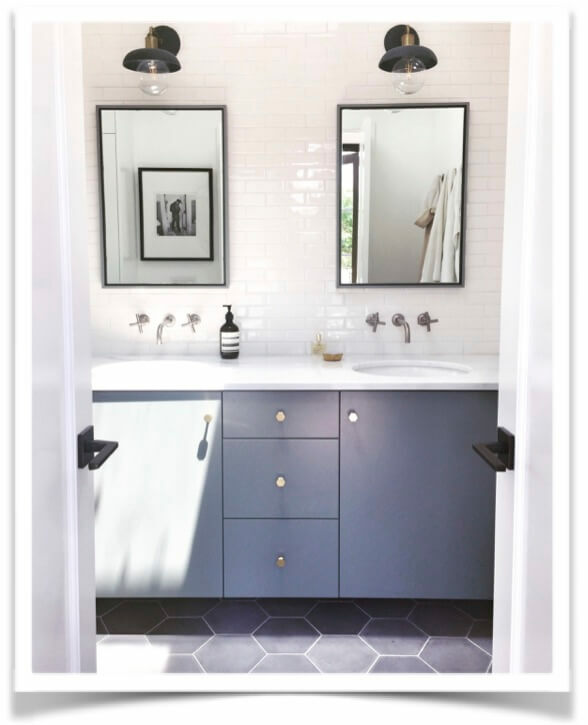 This master bathroom was part of a home addition and remodel that I worked on last year with my long-time friend Caroline Smukler, located in the Venice neighborhood of Los Angeles. The awesome owners of the house actually bought it from Caroline and her husband, and then asked her to stick around and help gut the existing first floor and design a second story. Caroline brought me on to collaborate as we’ve done numerous times in the past. Anyone who lives in Los Angeles probably knows what a great neighborhood Venice is — close proximity to the beach, cutting edge restaurants, design forward shops, etc. Our clients were planning a family and the only way to get more space on their tiny Venice lot was to go “up” so we added a master bedroom, bathroom and patio on the second story. Our inspiration for the master bathroom was a sort of industrial / European vibe and we wanted to stick with the neutral color palette used throughout the house. We paired smooth cement hexagonal tiles on the floor with handmade-looking subway tiles on the walls for added texture and depth. Then we used black and brass hardware plus grey cabinets and made sure there was lots of natural light coming through. FLOOR TILE – we selected 8” grey hexagonal cement tiles from Mission Tile West for their slight color variation. Here are two similar options that could work beautifully as well – Solid Hex from Cle Tile and Grigio Honed Tiles from Country Floors. WALL TILE – Walker Zanger has so many gorgeous ceramic tiles. We used Gramercy Park 2×6” tiles in Heirloom White for its high-gloss, reflective quality. Other contenders were the Cafe collection and Soho. Any of these would have worked beautifully in the space and created a similar feel. SCONCES – We fell in love early with the Terra Sconce by Cedar and Moss. If you like this idea but want other options, I also really love the Meadowlark Sconce and the Tilt Cone. CABINET KNOBS – To tie in the brass on the sconces, we used the Hex Knob by Schoolhouse Electric. If you’re more of a “pull” than knob person, the Midvale Pull in natural brass is a great option. MIRRORS – Our original plan was to use this Metal Framed Mirror and Shelf by First of a Kind which I do love. But when the mirror arrived we realized we had too many metal finishes and the look wasn’t quite right. Sometimes you really need to see all the components come together in person to know if it is the final look you are trying to achieve. (Designers do a whole lot of returns so don’t beat yourself up if you find yourself making “mistakes”). So, we switched gears and went to plan B which was to create custom mirrors with wood frames to match the sink cabinets. FAUCETS – Kohler’s Purist Faucet is such a good option when you need high design without a high price tag (when don’t you?!). I also like this and this one. ACCESSORIES – Turkish Foutah towels are a current favorite and I love Aesop’s line of hand soaps. A basket like this one is great for extra towels, and check Shop Terrain for potted succulent plants.